The day before I left for Japan, I met Sarah Suzuki, Associate Curator of Prints and Illustrated Books, Museum of Modern Art in New York, at the the Print Center's 85th Annual International Competition in Printmaking. She had suggested that while in Japan, I make my way to Naoshima, an island located on the Seto Inland Sea. Mariko, Yoonmi, Helen and I started our journey on the SHINKANSEN! From the Shinkansen, we switched to a smaller, slower train. And then again to an even smaller, even slower train. And then to a ferry. And then to a bus. And finally, we found ourselves traveling by foot on the island in a lovely mist of rainfall. On the island there are were several sight specific artworks. We took our time walking along the beach, climbing over, under, and through the sculptures. Not many people were on the beach and it seemed that we had the artwork and this Japanese island a bit to ourselves. 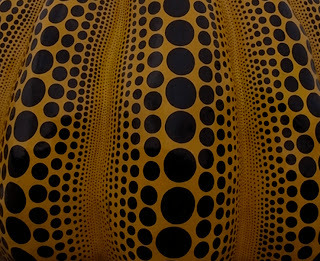 My favorite sculpture was "Pumpkin" by Yayoi Kusama. make this artwork so perfectly likeable. Helen, Mariko, Katie and Yoonmi posing with the pumpkin. Photo credit: Mariko Jesse. 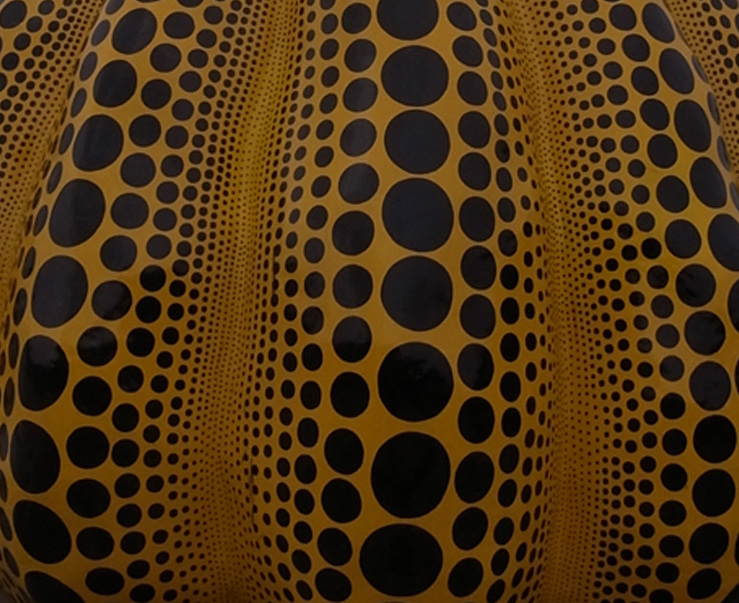 Naoshima is particularly known for its contemporary art museums. The Chichu Art Museum and the Benesse House were both designed by Tadao Ando. The Chichu Art Museum houses a number of contemporary art works that include James Turrell and Claude Monet. As we came to the wing of the museum designed for viewing the paintings by Monet, we were instructed to take off our shoes and replace them with the provided slippers. Shuffling in our slippers, we entered an unusually large and strangely shaped white room. The most powerful aspect of this room was its whiteness. I believe this room was meant to cleanse our visual pallet before we viewed the paintings. When I left the pallet cleansing room and entered the room with the paintings, I was overwhelmed by the presentation of the paintings and the space designed to house them. Instead of large gilded gold frames, these Monet paintings were framed in very large modern shiny white frames. The room was so large that the paintings seemed surprisingly small. And I just couldn't keep my eyes off the 1 inch square stones that made up the floor. The works by James Turrell were particularly great. The art worked seamlessly with the architecture, light, location, and aesthetic of the museum designed to house them. We experienced optical and spacial illusions in the best way that James Turrell can deliver. Yoonmi, Helen, Katie checking out "Open Sky", 2004 by James Turrell. Photo credit: Mariko Jesse. No hotel for us: we chose to spend the night on the beach in a Mongolian Yurt. Our yurt on the beach at night. Photo credit: Mariko Jesse.